momentous events in American history through the eyes of great leaders. effect, both on the press—who stopped glossing over the news and became muckrakers during that time—and the public—who received their first glimpse into the behind-the-scenes politics, thanks to the press. fact that he was so fat he once got stuck in a White House bathtub. Readers will almost feel sorry for him. 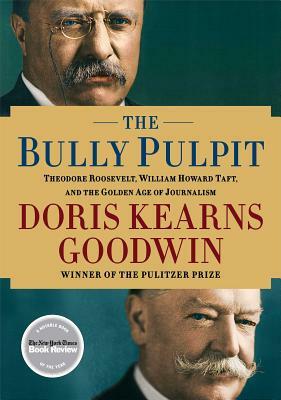 "In her beautiful new account of the lives of Theodore Roosevelt and William Howard Taft, historian Doris Kearns Goodwin spins a tale so gripping that one questions the need for fiction when real life is so plump with drama and intrigue." “Goodwin spent eight years working on The Bully Pulpit and the effort shows, much to the reader’s benefit and delight. She keeps the story clipping along, chooses enlightening anecdotes…and has the narrative and historical acumen to weave her theme through 900 pages. At 70, let’s hope she has at least a couple more biographies in mind…For now, savor The Bully Pulpit. It is a command performance of popular history."